This is the perfect camera for the "stumbler" and "fumbler" in your life or the skate and snowboarding teenager. 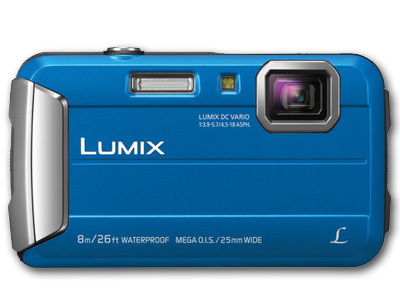 The blue Lumix DMC-TS30 Digital Camera from Panasonic is a compact "tough" camera that can shoot photos and HD video in extreme cold temperatures underwater or on dry land. The TS30 is dustproof, waterproof, shockproof, and freezeproof. Its 16.1MP CCD sensor provides clear, well-defined images even in low light and a Lumix DC Vario lens offers focal lengths from wide-angle to telephoto at 25-100mm in 35mm format. An 8x Intelligent Zoom function offers even longer digital zoom reach when needed. 23-area Autofocus and Quick AF combine to provide fast and accurate autofocus. The camera can shoot HD 720p video and has a dedicated one-touch video button. Shooting a still photo while shooting video is supported and MEGA O.I.S. (Optical Image Stabilization) compensates for camera shake in photo and video, offering clear images in low light or when shooting at telephoto lengths. Intelligent Auto Mode is available for point and shoot capability with all assistive features engaged and Scene Mode provides predefined settings to shoot certain types of scenes (Sunset, Starry Sky, Night Scenery, etc.) with the ideal camera adjustments. The camera also can shoot up to 8 frames per second in High-speed Burst Mode, shoot time-lapse images and offers Creative Control Mode in both standard and panorama dimensions so you can add specialized effects to your photos. A 2.7" TFT LCD screen with 230k-dot resolution provides composition and playback viewing. The "tough" features of the TS30 allow it to go underwater to a depth of 26'. It is also shockproof from a drop height of 5', freezeproof to a temperature of 14°F, and dust and sand proof. When dirty, the camera can be easily washed off with water. The TS30 features Advanced Underwater Mode which compensates for the red colours often lost when shooting underwater providing more natural looking underwater images. The camera also contains a continuous torch light when shooting video underwater or at night and it can be simply used as a flashlight when you are not shooting. Creative Control in recording mode and Creative Retouch in playback mode give you the power to turn ordinary situations into highly expressive images. Creative Effects include: Expressive, Retro, High Key, Low Key, Sepia, Dynamic Monochrome, Impressive Art, High Dynamic, Cross Process, Toy Effect, Miniature Effect, One Point Colour. With the Creative Panorama function, you can shoot and overlay consecutive horizontal and vertical images, then add filter effects with Creative Controls. The red colour reproduction of Advanced Underwater Mode compensates for the red tones lost in underwater shooting to create more natural underwater images. Additional action modes include Sports, Snow, and Beach and Snorkelling. Recording dynamic MP4 HD video in 1280 x 720p starts with the simple push of an independent motion picture button, and you can switch from video to photo shooting and back again instantly. Position the camera to record stationary observation for flowers coming into bloom, scudding clouds and other subjects. A series of successive images can be combined in-camera to produce time-lapse video. A built-in torch light helps record videos in dusky underwater environments or in low-light situations. When camera functions are inactive, you can turn the light on to illuminate subjects. When the camera's SD card is full, built-in memory automatically provides 220MB of additional storage, enough for up to 34 images.